CDS Manufacturing designed and built this system to automatically inspect the braze ring on tube and fitting assemblies. This system was designed to fit into the customer’s existing production line. Brazed assemblies are received at the near end of the system. 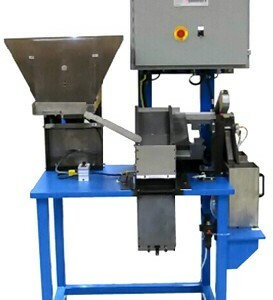 Linear vibratory feeders feed the assembly to an indexing dial plate for inspection. Assemblies that are missing a braze ring or that have an incorrectly brazed joint are gated as rejects and stored in a reject storage bin. 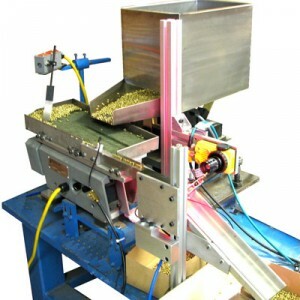 Acceptable parts are fed out the end of the system via the linear vibratory feeders. Process Overview Automatically feeds radiator tube / fitting assemblies to indexing dial plate for confirmation of braze ring presence and inspection of braze ring quality. Reject parts are automatically diverted to reject storage. Acceptable parts are fed out the end of the system.